Ok, imagine that you want to know which cultural events are going to happen in Madrid during the next month. You can find every culture and entertainment events sorted by district on the webpage https://www.madridcultura.es/. At Geoblink, we like to use the incredible WebScraper to make our lists of cultural events. Open the Developer tools of Google Chrome Browser in the customize panel or just type Ctrl+Shift+i. Then click on the Web Scraper Headless on the top of the banner. Webscraper works as a tree graph, where you have to create nodes that contain more nodes with information. There are different types of selectors, each one works with various characteristics and, depending on the object that you want to choose, you are to select a specific type….which may be a bit tricky at times. The most common types of selectors are Text, Links, and Element (that’s what we are gonna use for this tutorial) but, sometimes it’s necessary to use Element Click or Element Attribute. In order to save the selection. If there is more than one link, you have to match the Multiple option. To save all click on the Save selector button. Click on the saved selector. It appears that you can create more nodes inside. If you go inside one district link you can see that there is more than one activity on the main page. 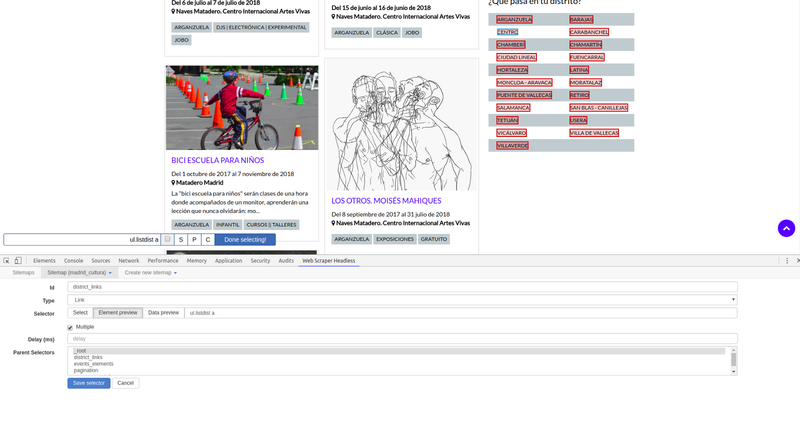 For this example it’s necessary to have an element selector that compiles all the information of the different events. To create that, it’s the same as the previous example, but now you have to choose Element in the type option. To select all the elements of the page, you have to click on the Select button, mark all the boxes and then choose the Multiple option. Again, if you click inside the previous selector, you can create more. At this point, you want to define the different information of the event, like name, date, place. To do that, create one selector for each data choosing Text on the selector type. You can also create a Link selector to obtain more information regarding the event (as the address and the event web page). If you have followed the previous steps, you have built a tree graph for the main page of every district. But, if you look at the top of the page, you can see that there are more than one page per district. That’s the reason why pagination is needed. 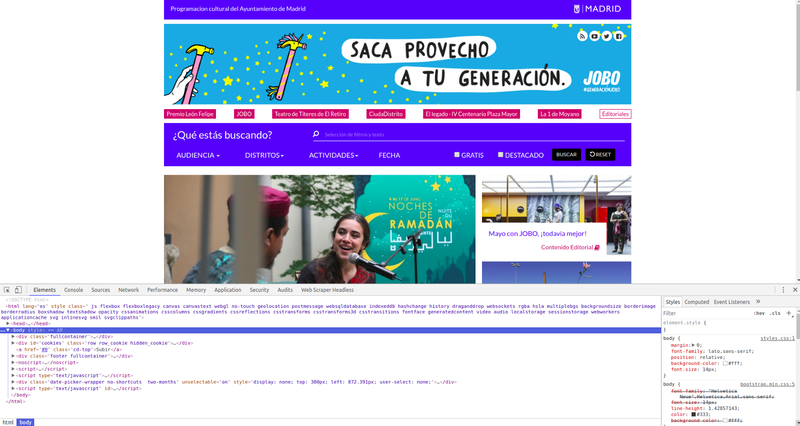 To create accurate pagination, you have to go to the beginning of the tree, to the same step, then choose Element Selector, then create a Link Selector and pick on the different pages. After that you need to edit the Event Element and modify its Parents Selector by selecting the previous node and the pagination selector that you have just created. You have finished building the Sitemap, so let’s scrape and see what happens. Click on the button Scrape and choose a Request Interval and Page load delay. The default values work, but sometimes it’s necessary to modify those. So, click on Start Scraping and a pop up should appear. It’s recommended to click on the Browser button to see how it works and to check everything pans out well. The pop up window will close at the end of the scrape. So when it happens, you can download the data. Go to Export data as CSV, and click on Download now! A CSV will be downloaded with all the data of the cultural events in Madrid. After that, it’s recommended that you clean the data a little bit because some columns with links are added in the process. Also, you can download the Sitemap that you have just created. Eventually you’ll get a nice CSV with almost 600 differents events for the next month in Madrid!